I'm not a believer in Karma or even the mantra that 'luck evens itself out over a season' but given the number of escapes Swansea had against St Gallen on Thursday it's difficult to get too downbeat about this result. Overall, the performance was pretty good but a slow start, a defensive omnishambles towards the end along with a good display from Boruc meant that this time we enter the international break on the back of a defeat. 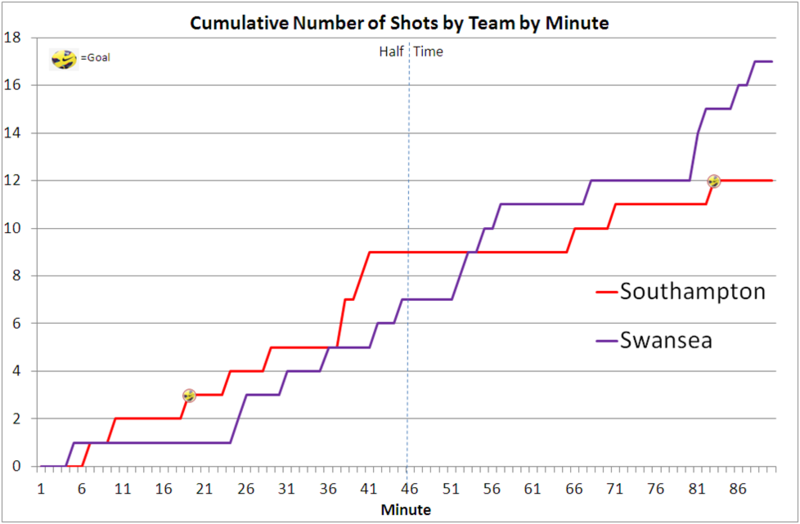 In terms of shots, Swansea had 17 compared to Southampton's 12, 6 of the 17 were headers (Southampton had 1) which was a rarity from Swansea but with Bony's presence is a useful extra weapon. 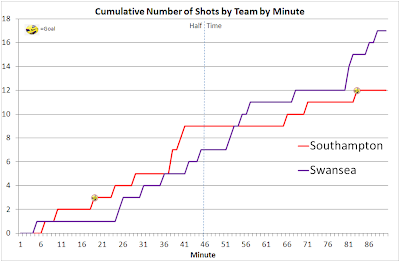 In terms of quantity, Swansea certainly had more in the 2nd half but arguably the better quality chances came in the first including the excellent move that saw Dyer hitting the post. Of the 7 saves Boruc had to make, 6 came in the 1st half. Apart from the absence of Williams in the starting line up due to injury, this was arguably the first choice side that started against Southampton with the only areas for discussion being would you have Britton instead of Canas (someone asked me on Twitter about the relative win rates with/without Leon which unless anyone already has the answer I'll probably look into sometime over the international break) or using Britton/De Guzman as an extra midfielder instead of playing Bony. One of the plus points from the match was Dyer's performance, last season it was a rarity for Dyer to play the full 90 minutes but he's done so for 3 of the 5 league games he's started this season. With Pablo hopefully back to fitness after the break it'll be interesting to see whether Routledge is the one of the 3 who misses out on a starting spot. The next 5 games see home matches against Sunderland/West Ham/Stoke along with visits to Cardiff and Fulham, while the 'no easy games' mantra should of course be trotted out and the Cardiff game will be 'interesting' to say the least, the other 4 are ones that offer real opportunity for points.